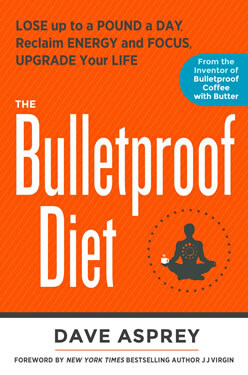 Before developing the Bulletproof® Diet, Dave Asprey was a successful Silicon Valley multimillionaire in his twenties. Yet even though he was eating just 1800 calories and exercising for 90 minutes, six days a week he weighed 300 pounds. When poor health started affecting his energy levels and willpower, Asprey invested more than $300,000 in search of a solution. Over a 15-year period he explored a variety of scientific and alternative therapies so that he could achieve peak performance. Asprey wants his readers to challenge common beliefs about health and weight loss. On the Bulletproof® Diet you will adopt new habits that may go against what you have been taught about losing weight. Asprey explains his rationale and scientific explanations why these lifestyle habits are beneficial when your goal is to eliminate excess fat. The Bulletproof® Diet is similar to a Paleo® approach. However, Asprey explains that his methods are different because they are based on his research into biochemistry and human performance. Because of this, he claims that his diet overcomes some of the negative effects that can occur when eating Paleo-style long-term. One portion of fruit or starch is allowed daily. Eliminate sugar – including fruit juice and sports drinks. Replace sugar with healthy fats such as grass-fed butter or coconut oil. Remove grains and vegetable oils such as corn, soy and canola. Eliminate all synthetic additives including artificial flavorings, aspartame and MSG. Consume grass-fed meat such as beef, lamb and bison. Switch to pastured eggs, wild seafood and organic free-range poultry. Preferably avoid legumes such as beans, lentils and peanuts. If you do eat beans soak, sprout and cook them. Remove all homogenized and pasteurized dairy. Full fat, raw and grass-fed dairy is acceptable for most people. Choose organic fruits and vegetables. Cook your food gently and maintain a high intake of raw food. Limit fruit intake to 1-2 portions a day. Emphasize low glycemic fruits such as berries, apples and grapefruit. Add herbs and spices to flavor your meals. Bok choy, cilantro, Brussels sprouts, celery, asparagus, broccoli, cauliflower, avocado, coconut, olives, whey protein, grass-fed beef and lamb, free-range eggs, organic grass-fed butter, sweet potato, pumpkin, coconut oil, blackberries, raspberry, blueberries, lemon, lime, xylitol, stevia, coffee made from Bulletproof Upgraded Coffee beans. Asprey says that exercise is not the most important part of achieving your desired body. It can even do more harm than good if done improperly. To gain these benefits exercise at a very high intensity for no longer than 20 minutes, three times a week. Encourages consumption of organic, unprocessed food. Provides education about common sources of dietary and environmental toxins, including xenoestrogens and mycotoxins. High fat diets tend to effectively reduce appetite. Addresses adrenal fatigue and the need for adequate amounts of quality sleep. Exercise program requires only a minimal time investment. Requires elimination of a wide variety of foods including bread, pasta, rice, potatoes, cereal and legumes. Only allows one portion of fruit daily. Much higher in fat than is generally recommended by most health experts. Author encourages the use of potentially dangerous prescription medications for enhancing brain performance. The Bulletproof® Diet is a weight loss plan based on scientific research for maximum fat loss and human performance. This Paleo-style program will especially appeal to executives and others who wish to optimize cognitive function, while losing weight. It will appeal most to those who can adhere to a strict eating routine. Asprey, Dave. The Bulletproof Diet: Lose up to a Pound a Day, Reclaim Energy and Focus, and Upgrade Your Life. N.p. : n.p., December 2, 2014 Print.